Climbing to Mera peak is not an easy thing with lots of uphill, downhill and high altitude. Average fitness is required not to be in the pain make sure you have enough walking and climbing experience to enjoy the trek and climb. Most of the days include 4-7 hours walking. 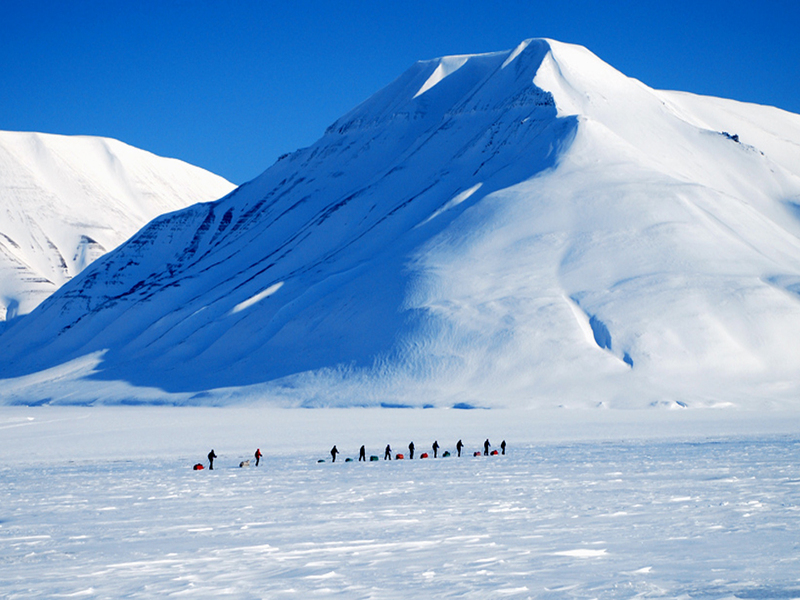 Altitude can be the problem too, so drinking lots of fluids and going slowly is important to avoid altitude sickness. Arriving at Kathmandu Airport, our office representative will meet you at the airport and transfer you to the hotel. You will then have some free time explore Thamel. (Overnight at hotel on BB basis). After breakfast, the company owner and your trekking guide will meet you on the hotel and discus about all programs and coordinate any last-minute arrangements. After staff meeting, one of the our professional tour guides will take you for a sightseeing trip for 3 hours and then back to the hotel. Rest of the day can be used for travelling around Thamel and buying any last minute equipment and other necessities. (Overnight at hotel on BB basis). Early morning transfer to airport, 35 minutes scenic flight to Lukla and experience your first breakfasts in the mountains whilst the Our team organizes porters, while the guide sort and divide the load baggage to be carried by porters. Then, we start our trek further an easy day through the woodland above Lukla. A good trail leads through pasture to the edge of a diminishing forest of rhododendron and pine which clothes the steep hillsides above Lukla. We make steady progress on a good trail, crossing ridges and streams up to ‘kharka’ used for grazing yaks where we’ll stop for today. Overnight at tea house on full board basis. Today we Zatrwa la pass (4,600m/15,093ft)utanga we continue a long day walk around 6-7 hours crossing the Kalo Himal Ridge that separates the Khumbu from the Hinku valley that lead across this ridge is the Zatrwa La, traversing to the right and finally descending steeply to Tuli Kharka (big pasture) where there are several basic lodges where we stop overnight at tea house on full board basis. Today, after a breakfast we continue our journey descending to Hinku valley of Gothey. This is a good place to camp and there are several teahouses around and you can visit and go and watch the local lifestyle in the remaining time. Overnight at tea house on full board basis. The following day is another short day as you trek in the shadow of Mera Himal along the ridge of the Hinku Khola. The west bank of the Hinku Drangka northwards, we will take lunch at Gondishung, a summer herders’ settlement. Beyond Gondishung we pass a 200 year-old Gompa built beneath a massive boulder, to burn some juniper at the shrine, an offering that just might ensure a successful ascent of Mera Peak. Thagnag is a summer grazing area with the simplest of lodges and shops starting to develop. Overnight at tea house on full board basis. Another an acclimatization day is essential here. It is in a superb setting surrounded by stunning peaks. There is a huge moraine in the north of Tangnag where a beautiful glacial lake, Sabal Tsho is dammed which is definitely worth a visit. A cairn (5,270m/17,290ft) on the flanks of Kusum Kangguru can also be rewarding and beneficial for acclimatization. 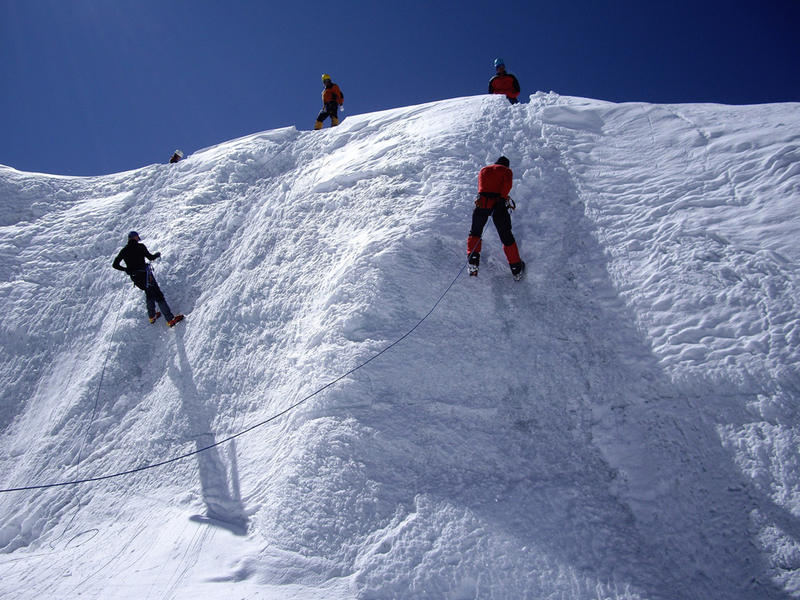 Our climbing Sherpa provide you training course. Overnight at tea house on full board basis. 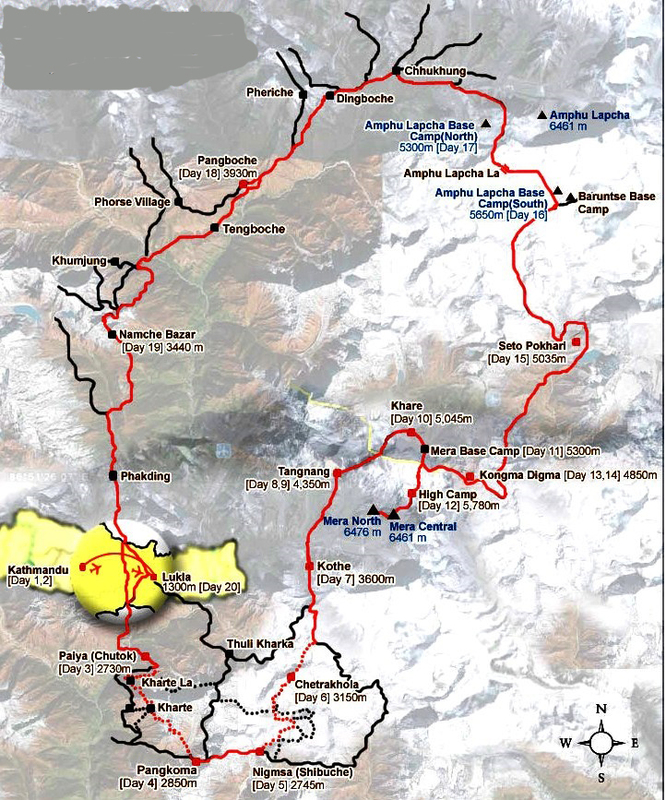 Today we are heading up from Tagnag towards the Mera Base camp at Khare. We follow the lateral moraine of Dig Glacier to Dig Kharka, which offers spectacular views of Charpate Himal. 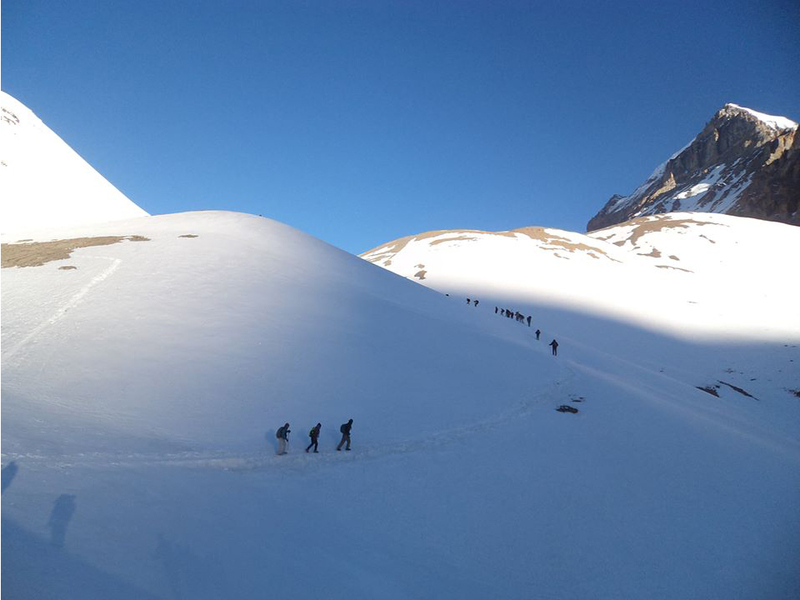 The trail goes through moraines and to the snout of the Hinku Nup and Shar Glaciers and then climb to Khare.Overnight at tea house on full board basis. A very short trek allowing for as much acclimatization time and a day walk as you make your way to Mera Base Camp. We first climb to the crest of the moraine above Khare and then up a steep slope of scree or snow to reach a boulder strewn bowl below the lower tongue of the Mera Glacier. Reaching the pass Mera La (5,415m/17,766ft) allows us to see spectacular views; we then descend 100m (328ft) towards the Hongu side and set up base camp in the moraine below the ice and we overnight in tented Mera Base Camp. Making your way to Mera High Camp can be hazardous if it has recently snowed, as there are a number of crevasses here. You make your way to the top of the rock band, which is marked by a large cairn. You set up a high camp and from here the views are outstanding, with Everest, Makalu, Cho Oyu and more piercing the skyline. This evening we overnight at tented Mera High Camp. After a great succeed of the expedition to Mt. Mera we descending to Hinku valley to Gothey for our overnight stop at camp. Enjoy the evening with local wines or whatever you want . Overnight at tea house on full board basis. Today, we again climb up through the lush forest on the west side of the Hinku Valley to Tuli Kharka below the Zatwra La where we’ll stay overnight at tea house on full board basis. Today, we have a last day for the trek and we start to climb few hundred meters to the Zatrwa La top will be our last climb of the trip. After the top we descending up to Lukla village where we concludes the trekking part and this evening enjoy with crews at the last dinner at the mountain and overnight at teahouse. Early morning fly back to Kathmandu and your guide will transfer to hotel. You may have time to relax after long journey and take back your breath and rest at your hotel. Free day at Kathmandu. You may go for shopping or walk in the street yourself. Departure for your onward journery. 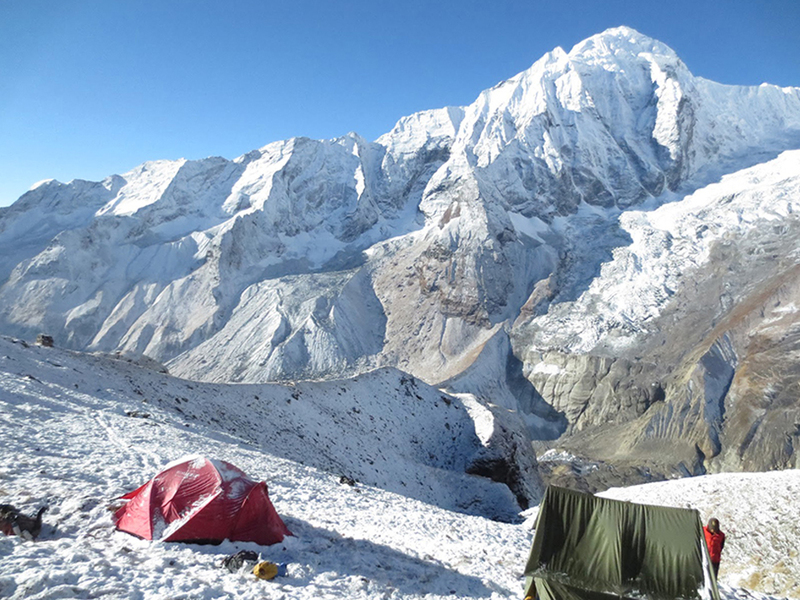 During Mera Peak Climbing, we will provide tents accomodation and authentic Nepalese food (Dal Bhat) as well the more common international cuisine (Tibetan, Continental, Italian, Indian, etc.). 3 main course meals will be provided during trekking and only breakfast is included while you are in Kathmandu and. Autumn (Sept to Nov) and Spring (March to May) are the best seasons to do Mera Peak Climbing. The weather is sunny and warm with outstanding views. However, the temperature during winter could be harsh for most guests and there chance to get snow too. Climbing in the Summer or Monsoon seasons (June to Aug) will be affected by rain but the Summer climbing could be a boon for a keen botanist. Please make a selection How difficult is the Mera Peak Climbing? How fit do I need to be to climb Mera Peak? What if I am a solo climber? Is there a supplemental for singles? When should I go for Mera Peak Climbing? What equipment do I need to climb the Mera Peak? Are there any ATM's on the way? Do I need to purchase my own travel insurance for Island Peak Climbing? Will I get altitude sickness on the Trek and climbing? Will I have access to the Internet? Can I charge my camera batteries on the trip? Will my mobile phone work on the Climbing? What is the accommodation like? What happens if I get sick or get hurt while climbing? Who are the guides? Will I have to carry all of my own stuff on the Trek and Climbing? Is the water and food safe on the Trip? More questions? 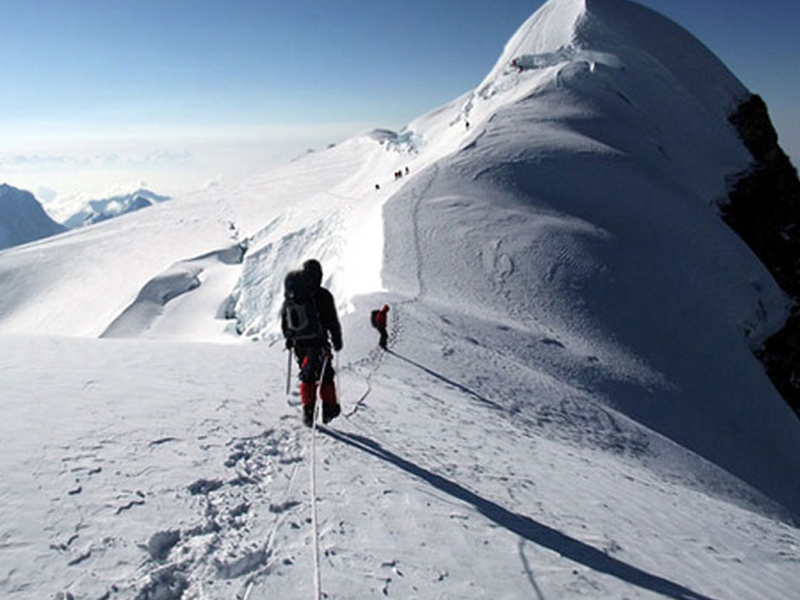 Climbing a peak is quite hard, as a climber, ropes, ice picks and essential item for climbing are mostly needed. There are some of vertical climbing involved. The ground is rough, rocky and gravel strewn. Most of the climb involves long paths that go up and then down. People with weak ankles should take caution. Use caution or seek the expertise of a guide. No problem. Many of our customers are traveling solo. Climbing peak always has export Sherpa and guides. It may also be an option to join a group. Yes, there is a supplemental cost if you are traveling alone, please contact us to find out more. 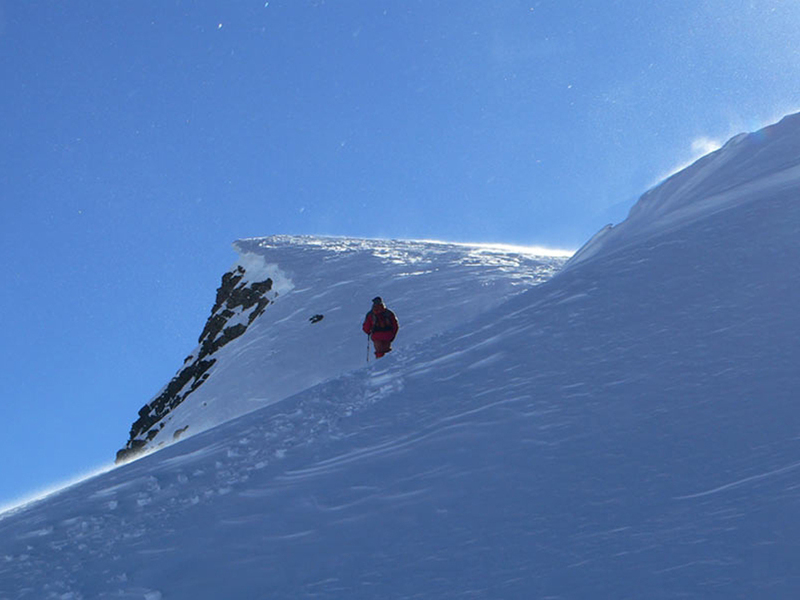 The best time to climb Mera Peak is in April and October. Except the personal usable gears like shoes, goggles, socks, sun creams, hat, trekking cloths and shoes , we provide all essential items whatever is needed for climbing. There are no any ATM's after starting trek for climbing, but all the cities has. It is possible. There is no way to tell beforehand how you will be affected by the altitude. It is usually above 3500 meters when people start to feel symptoms. Please see our page on altitude sickness for detailed information. Yes some of the place you will be able to use Internet if there in not any technical probem. eg; Lukla, Namche Bazzar, Pheriche and Gorakshep. Yes you can charge batteries but you'll be charged by the hour and you'll have to bring your own charger. Charges vary between 100 and 300 rupees per hour. When you left the usual trekking route and start to follow climbing trail there are no even place to charge batteries, we advise you to bring some extra batteries. Cell phones work at most of the places only on the trekking trail, depending on your mobile provider. There are also phone services almost everywhere we go except climbing area. We can tailor the accommodation to meet your requests. While in Kathmandu we generally stay in very nice 3-4 star hotels. During the treks, we will be staying in local guest houses along the trail. The guest houses vary, but overall are clean, charming and meet all of your needs. When we move on the way of climbing, will provide tents accommodation. There are basic pharmacies in larger villages along the trek. There's a hospital in Khumjung and a few altitude sickness clinics open during the peak season. Basically our guide will sort out the things what to do. However in the event of an emergency there usually is access to a telephone line or satellite phone for an evacuation via helicopter. This is another reason to be sure you are covered with adequate travel insurance! No, unless you request to. Our porters will carry up to 12 kgs of weight for each trekker. All you need to carry are your essential items for the day. The porter fee is included in the price of your trip. We plan for 1 porter for 2 trekkers in accordance to the guidelines set out by the International Porter Protection Group. If you would like more weight to be carried, please let us know. In general 12 kg is more than sufficient.